Returning from the West Island for a week and a half, I found some time to wander more in the vicinity of Eggie—also one of New Zealand’s cultural centres of insane mountain running. I’d been up to the summit a little over a year ago, and this time the weather wasn’t exactly cooperating for that. 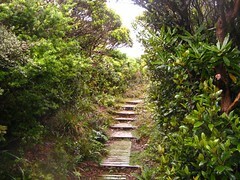 Instead, I decided to wander up an easy route towards Pouakai Hut and find somewhere to read my book for the day. For a more complete description of the area, there’s a write-up of a variant of the Pouakai Circuit in late 2010, during which anyone who reads carefully will note it did not rain at all. Location: Egmont National Park, above Mangorei Road. Route: Up from Mangorei Road past Pouakai Hut, up Pouakai Summit, then back and up Henry Peak, and down to road again via hut. Having parked at the end of the public part of Mangorei Road (there’s a 350 metre walk along a non-public driveway to the park entrance), I sorted things out and began the climb up the Mangorei Track at about 10.15am, just as the rain began. No matter, as it’s under trees for some time yet and I waved to one of the nearby residents as they drove past whilst I struggled with my raincoat. The Mangorei Track is one that, when not being used as a track, tends to be a natural waterway. Generally this means mud and erosion, except for where there are slippery tree roots. To make up for those places where there are no tree roots to slip on, DoC has been steadily funding the wooden boardwalkisation of this track. Aside from a section in the middle, the majority of it now seems to be boardwalked. It’s not out of character for the rest of Egmont National Park, which I’m guessing from what I’ve seen to date is probably one of the most artificially board-walked and artificially tracked parks in New Zealand, certainly in the North Island. I guess there are good reasons for this, notably the amount of rain combined with the park’s popularity, being both labelled a National Park which attracts people, and also being so close to New Plymouth. It’s likely that without all the stepping and boardwalking, many of the tracks would be slippery and barely navigable mud-slips, but without meaning to belittle many of the other neat things about the park, I think the ubiquity of boardwalks in this area is one of my least favourite aspects. In any case, my point was that the Mangorei Track hasn’t escaped the boardwalk craze in this region. 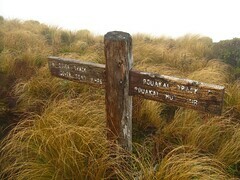 Pouakai Hut, which sits not far above the bush-line and relatively sheltered below a crest, is sign-posted as 2 hours and 15 minutes from the bottom. This is probably reasonably realistic, although I found for me by myself (I’m relatively fast) and without stopping much, the climb took about 1 hour and 20 minutes. 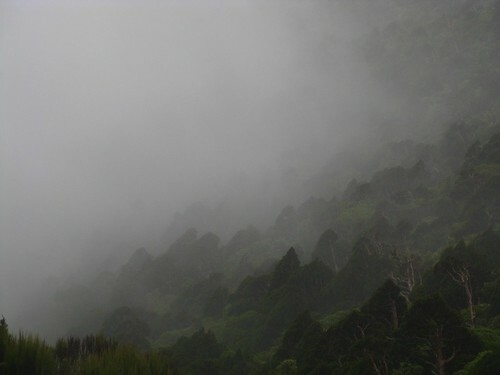 The trees began to open to a more scrubby environment about an hour from leaving the road, which is about 1000 metres above sea level (460 metres of climbing). Ten minutes later by my time, there’s a reasonable view looking north over the farm-land, towards New Plymouth. I met a few people coming down as I ascended, all of whom I think had only gone up to the hut, possibly since earlier in the morning, and were now on their way back. These were the only people I met out in the open for the entire day, and they were already leaving. Maybe a forecast for afternoon heavy showers had something to do with it. 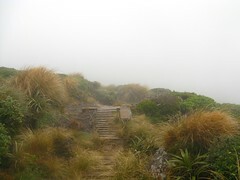 I stepped into Pouakai Hut at 11.40am just after the rain began to come down rather heavily. It was accommodated by just one chap (recently immigrated from Egypt and in New Plymouth for the local WOMAD festival) in the process of walking the Pouakai Circuit. He was trying to decide whether to finish his walk towards North Egmont today, or sleep another night and try tomorrow. I only had the current day’s forecast of heavy showers and rain, and I think this probably reinforced what he’d already been thinking, especially after I informed him that aside from being a seven letter word with only one consonant, Kaiauai Hut along the way was now nothing more than a bus shelter structure. I still hadn’t fully decided where to go after reaching the hut, but after a quick chatter the rain began to ease off into a damp mist. Without much wind around it seemed like an opportunity to head up to the Pouakai Summit, which is out of the way from most common routes and so I’d not been there before. I wrote in the book, and left into the grey-ness slightly after midday. Pouakai Hut lies sheltered a couple of minutes below the vaguely formed ridge along the top, and as soon as I reached the track junction above I began to wish I’d brought a balaclava. That was really only a small mis-comfort in the end, though, with the slight wind-chill, and the problem evaporated as I dropped below the ridge and nearby peaks again soon after. The track along here remains fairly good, water pooling excepted, until about the time that the Pouakai Circuit veers off into the swamp towards Holly Hut after about 30 minutes. 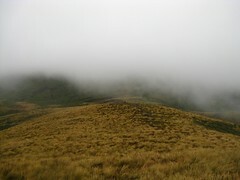 Holly Hut is clearly visible in the distance from the ridge just above Pouakai Hut, and remains visible on the far side of the swampy plateau for much of the walk towards that junction. 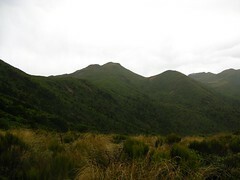 After this, the track towards Pouakai Summit becomes more of a less-walked poled route through a tussock landscape below a small peak called Tatangi (1336), until eventually climbing towards Pouakai Summit via some slightly slippery ad-hoc water-eroded ditches through the mud. Current LINZ-issued Topo50 maps show a junction, about 300 metres short of Pouakai, with another track coming up via spot-height 1375. I reached what I thought was this point and saw no obvious sign of a track junction—it may be that the alternative route no longer exists in a discernible form, or it may just be missing at the top. To be safe, I pulled out my compass to check my bearing, and was immediately confused when the compass directed me back the way I’d come, even after checking and re-checking several times. Nearly always, if intuition says one thing and a compass says another, it’s better to follow the compass, but on this occasion at least I was able to pull out my GPS, which includes a built-in electronic compass, and compare the readings. Doing this confirmed that at some point, the needle of my baseplate compass had flipped, and the red end now pointed to magnetic south instead of magnetic north. In hindsight there were some other tell-tale signs, which I’ll probably write about separately. Older signage near Pouakai Summit. Enlightened with this knowledge I continued through the cloud, and soon after I spotted the trig station that marks Pouakai Summit fairly clearly. This area is certainly less-managed in recent times, which is clear by comparing the signage just below the summit that marks the continuation of the Dover Track down to the intersection of Carrington and Dover Roads on another edge of the park. By now it was almost exactly an hour after I’d left Pouakai Hut, and there’d still not been much more rain than drizzle—certainly not heavy rain. The conditions weren’t beneficial for hanging around, though, so I turned and went back. 50 minutes later at around 2pm I was back at the sign-posted junction just above Pouakai Hut. The time still seemed too early to go home, and the forecast heavy rain had yet to arrive, unless it had already come and gone with a couple of very short heavy downpours, or bypassed the area completely, so I continued along past the junction for some time longer, hoping to reach Henry Peak. 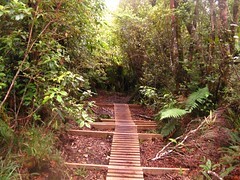 Once again being part of a highly marketed circuit in Egmont National Park, the track is heavily boardwalked in this direction. Other than that it’s a nice section of tops travel. Looking down from part way up Henry Peak… more boardwalks. Henry Peak is a fairly steep climb, made either better or worse (depending on your perspective) by the constant artificial steps and ladders, once again necessary to reduce erosion. It’s a shame about the boardwalks. For me at least, I find the unnatural and consistent hard-ness of the surface leads to higher stress being placed on things like knees, and when artificial steps are involved I often find that they interfere with my natural stride, and they’re more tiring to climb than a more simple slope. I think this is one of the few parks in New Zealand where I’d seriously consider wearing different footwear than regular tramping boots. Tramping boots aren’t well designed for walking on consistent hard surfaces. I don’t suppose much can be done for a place that receives so many visitors, though. I was on Henry Peak at about 3pm, on top of which is effectively a wooden lookout platform that affords great views of the general direction of the mountain in the centre of the park. Today that general direction afforded the sight of much grayness. For a few minutes I tried pulling out a book to read, but spots of rain didn’t help and eventually I packed up and went down, returning towards the hut via the boardwalks. 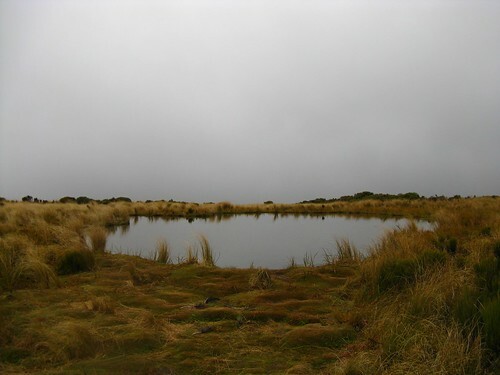 A couple of small tarns exist on the way back, about half way between Pouakai Hut and Maude Peak. These are shown (but not named) on the official Land Information New Zealand Topo maps, and they’re sometimes referred to as “the lakes”. rendition, pulled from the web. For some reason it’s a popular place to take photos of Eggie with reflections, and the Internet is now littered with more than a few variations of effectively the same photo by different people taken in slightly different conditions. For instance, here’s one example and another example. This one even has a person in it, or you could see the mountain without snow if you prefer, or from a couple of metres closer by the same professional photographer, or a different perspective again, or with a clear sky. You might notice a common theme, and even common patterns of mountain tussock, in all of these. If you get the picture, taking this photo is something that everyone along the Pouakai Circuit, or in the area in general, is meant to do. Most people try to put a slightly unique spin on it, and so I had a go. I’m not convinced that my own effort worked as well as the examples to which I’ve already linked. This is because of the fault in my compass, which made it tricky for me to determine exactly where to find the mountain. As such, the mountain is not completely in frame. 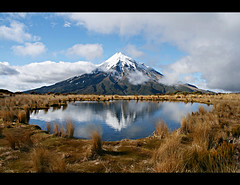 Mount Taranaki seen from The Lakes on the Pouakai Circuit. Back at Pouakai Hut at 10 minutes before 4pm, I woke up the Egyption guy to indicate I was passing through, just in case he was so demoralised as to want a ride out. He didn’t. An hour and twenty minutes of steps and knee-wrenching boardwalks later, which I began to curse after the first half hour, I was back at the public end of Mangorei Road. Not a bad day out. 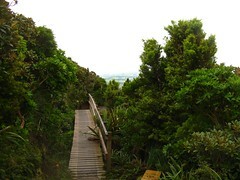 This entry was posted in daywalk and tagged bagged:pouakai hut, daywalk, egmont national park, independent trip. Bookmark the permalink. It appears that they really need the boardwalks to prevet track erosion in this park. Everywhere feet go, becomes mud, then the rain washes the mud down the hills. Before the boardwalk, the track was severely rutted by both feet and water. My first time in the area in about 2000/1ish the track down Henry Peak was so deeply rutted, I was walking in a trench almost up to my shoulder. Agree that I haven’t seen boardwalkification on this scale elsewhere.. Rakiura Track in Stewart Island has a fair bit I believe but have nit been there myself. I won’t argue with that. Something’s clearly needed when so many people visit a place that gets so much rain and mud. I was just meaning to indicate that I think it lowers the appreciation I have of the experience to an extent. It doesn’t feel as much as if I’m getting away from things as some other parts of the back-country do. It also makes harder work for tramping boots, which would be fine if there was a guarantee they wouldn’t be important in places without boardwalks. But then, the insane mountain runners don’t exactly wear boots. Thanks Stuart. Reading the description compared with the current map I think I can at least imagine where it might’ve come out. Does the route guide make any mention elsewhere of Saunders Road? From the map I’d have guessed that was the more obvious way in to go up that side, but only because it’s there at all. In hindsight I’m now wishing I’d gone to check it out and see if I could find the top of some kind of track. I guess I was a little distracted by the compass thing at the time. The route guide makes no mention of Saunders Rd. Tracks & routes in this area have always commenced at the end of Puniho Road. Access via the route to spot-height 1375 was apparently cut by Dave Rawson in approx. 1974/5. It is used primarily as a hunting track and had some tramping club use. From memory, when I was last there, the route up through the scrub was getting rather vague and would now probably be indiscernible near the top apart from the occasional wooden pole to follow. Hope you get round to writing about the ‘compass thing’ some time. Yep, as of yesterday morning if you still haven’t seen it. Thanks and interesting. There seem to be a few tracks that LINZ has left on the Topo50 maps which are no longer too clear, which is neat in some ways. The 4WD track of the Mangorei Track down to the end of Plymouth Road is another one that I’ve never noticed the end of but must have passed by there more than a few times. Next time I’m in the area I’ll try to remember to make a point to keep an eye open for it. Mike – an Update on Puniho Picnic Area-to Trig Pouakai 1399m route via spot-height 1375 as discussed in replies (3, etc.) above, following a return trip last Friday. Old Red ‘Track’ sign, along with several red & yellow permolat markers, indicate track start at river bank, after crossing Stony River. Track in very good condition, to scrub line at 910m, apart from 4 tree falls in lower reaches requiring negotiation. From 10 minutes into the scrub line the track is overgrown, requiring pushing through, but route is relatively discernible with head clearance all the way, this section taking about 45 minutes. The next section to spot-height 1375 takes about 20 minutes, travel made easier with lower vegetation. 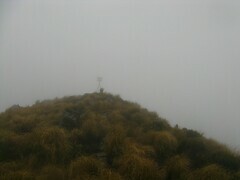 New wooden poles have been positioned just before spot-height 1375 and are followed round to Pouakai Trig. If returning on this route, keep to centre of ridge, from spot-height 1375 to scrub line. Hi Stuart. Thanks for the update, and I hope things are well with you. Cheers. Mike.